The last decade has witnessed a conspicuous alteration in policies protecting unemployed people in modern welfare states. Social policies are increasingly designed to encourage economic independence. Policy makers have introduced a wide range of reforms linking disability, unemployment, and welfare programs cash benefits to work-oriented measures.Welfare policies are being framed by a new emphasis on recipients' obligations, emphasizing that the receipt of benefits creates a responsibility to take action towards becoming self-reliant. The objective is to minimize the duration of dependence or improve the well-being of family or community. Activating the Unemployed addresses this growing interest in work-oriented measures. This represents a shift in the dominant discourse on social welfare from focus on the citizen's rights to social benefits to emphasis on their responsibilities to work and lead an active life. 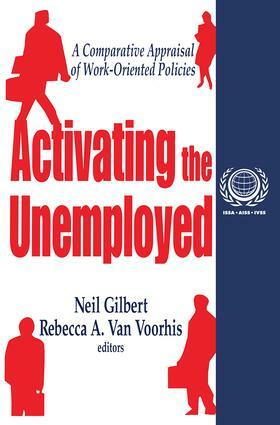 In this volume, a distinguished array of international contributors provide cross-cultural perspectives to analyze recent diverse policy initiatives to activate the unemployed in nine countries-Britain, France, Italy, the Netherlands, New Zealand, Norway, Sweden, Switzerland, and the United States. Each provides a systematic account of the background, design, implementation, and results of employment-oriented measures. Collectively they permit comparison of organized responses to common problems in the areas of public assistance (welfare), unemployment, and disability, among others. Further chapters seek to broaden perspectives on policy options, the issues raised, and lessons learned in the course of activating the unemployed. This thorough and insightful account addresses significant contemporary issues and concerns about welfare, social security, and unemployment. It will aid policy makers, professionals, and scholars in assessing current trends in welfare in various countries throughout the world. Sweden—Still a Civilized Version of Workfare?